Charles gave an amusing and informative talk, entertaining us with personal anecdotes, outlining the history of the development of the river over the last 150 years as arguably one of the most famous game fishing rivers in England and Wales and its sad decline in the latter half of the 20th century. This was due in great part to a disease, which had spread from Europe and arrived in our area in 1968. Net fishing and seals in the estuary, mink and otter, manufacturing and agricultural pollution all had a detrimental effect and fish stocks became depleted. Charles was pleased to be able to say that the numbers of all fish in the river are increasing. In January the committee room was packed to capacity with people eager to learn of Charles Inniss’s life and times at the Half Moon, Sheepwash, and to hear of his exceptional work in running the fishing on the River Torridge over a period of some 40 years. The talk coincided with the recent launch of his book Torridge Reflections, which is now in its second print run and while everyone enjoyed the usual refreshments, he was kept busy signing the book for those keen to have a copy. There was no meeting in February. Instead 19 members enjoyed a visit to Great Torrington for a tour of Dartington Crystal. The company opened their factory in 1967 and the visitor centre offers an opportunity to study the timeline of the factory up to the present day. There is also a visual history of glass through the centuries and workshops where visitors can try various creative activities such as glass painting, jewellery making and even glassblowing. From an elevated viewing platform we were able to watch the manufacturing process of glassblowing from a blob of molten glass through various stages to produce a beautiful item of crystal: a wine glass, decanter or ornate vase. Working our way along the elevated walkway we proceeded through the different finishing departments to final packing. Some 1,400 items of crystal are manufactured each day. After the tour members were able to enjoy refreshments in the café or browse in the Dartington Crystal outlet store and marvel at the beautiful glassware on display. At the March meeting we were joined by Andy Lane who is an auctioneer, a surveyor and an expert on the Red Ruby Devon cattle. With his love of the Red Ruby, his association with the Devon Cattle Breeders Society and his knowledge of the area’s farming families, he entertained us with a detailed and amusing history of the Red Ruby Devon and its development through the centuries to the present day. The Group’s Annual General Meeting was held on 17 April. The Chairman, Maurice Thomas, reported another successful year in which the members enjoyed a number of very interesting talks by well-known local personalities as well as two outside visits. Our archives continue to grow and we have received a donation of 11 albums of press cuttings from a former prominent resident, Mrs Pat Gilbert. Mrs Gilbert was at the forefront of the building of the Village Hall and was also our village correspondent for many years. We have also received a donation of a number of interesting books from the estate of the late Harry Lymath of Sheepwash. Maurice thanked all the members for their kind help and for the interest shown over the past twelve months. He especially thanked the Vice Chairman, Charles Dumpleton, and the other officers, all of whom were re-elected for another term of office. Prior to the AGM the members joined with the Highampton Ladies Group for an entertaining illustrated talk by Simon Dell on the Dartmoor Prison Riot of 1932. Simon was kept busy afterwards with book signing and answering questions from members. After the talk the Ladies Group kindly provided very welcome refreshments. 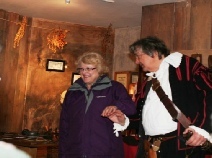 We were given a most interesting and entertaining tour of the centre by guides dressed in costume of the 17th Century and were given an insight into life in Torrington during the period of the English Civil War. After a very pleasant lunch in the centre’s restaurant, the members were given a guided tour of the town where we visited the refurbished Victorian Pannier Market, the Town Hall (which still has the original yard known as the Shambles), the Black Horse Tavern (reputedly the oldest pub in North Devon) and the parish church of St Michael which was blown up in February 1646 after the defeat of Lord Hopton by Fairfax while some 200 royalist prisoners were held inside. After a tour round the church, the members were shown the “pebble-mound” mass grave situated in Church Walk where these unfortunate prisoners were buried. We then continued our walk around the town and its historic sites, passing the notable Torrington glove factory which at one time provided a great deal of the town’s employment. All in all this proved a fascinating and most enjoyable day for the group! 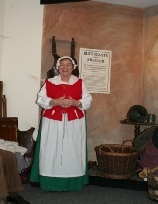 In May our members visited Torrington 1646 in Great Torrington. Members were invited to model costumes of the time and were involved in role play. In addition, Dennis told many other amusing anecdotes that related to personalities that had lived in and around the town in past times ― all in all, this was a most enjoyable evening. Our August meeting was a visit to Great Rutleigh, Northlew. Mrs Barbara Nash met our members and kindly showed us around her family home, which is a fascinating Grade II listed farmhouse hidden away on the outskirts of Highampton. It was interesting to learn that Great Rutleigh was a pre ‘Domesday’ manor that went under the name of Radeclive. At one time in history, it went to Walter Treawen’s portion of the Giffard fee - which it was held for ¼ fee. The manor house, now a farmhouse, was built in the latter end of the 1400s or early part of the 1500s by William Kelly, most likely the William Kelly who was married to Jane, the daughter of Sir Hugh Trecallel, and who died in 1534. William Kelly was responsible for some of the rebuilding of the Parish Church of St. Thomas of Canterbury, Northlew. The Kelly Arms can be seen preserved in the church. During the nineteenth century the manor was in the possession of Mr Woollcombe, who was also in ownership of the manors of Ashbury and Highampton. Our venue for July’s meeting was filled to capacity when it was learnt that popular Dennis Bater was presenting, at short notice, an illustrated talk on famous personalities who had lived in and around the town of Hatherleigh. Among the personalities we heard about was Lieutenant-Colonel William Morris, of Balaclava fame. William Morris was born at Fishleigh in Hatherleigh and as a young boy, hunted with the famous hunting parson, the Rev Jack Russell, where he gained his early riding skills. 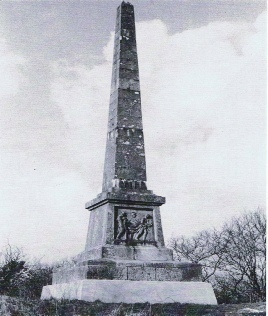 As an army officer, Morris led his men into action in the Charge of the Light Brigade and later, an obelisk (pictured right) was erected by public subscription to his memory on the top of Hatherleigh Moor. When Dennis spoke of more modern times, we learnt how Joe Vick (pictured left) was instrumental in bringing the livestock market to Hatherleigh in the 1940s, and how it was his ambition to create an abattoir as a natural extension of the market. He took the group on a journey through the history of Policing in London in the early 1800s through to the present day – with many entertaining anecdotes along the way. Our guest speaker in October, for the second time, was the popular Mr Simon Dell MBE. Simon is also a retired police officer but from the Devon and Cornwall Constabulary. Since retiring from the force, Simon has made a great name for himself not only through his talks but also as an author of local history books covering the West country. On this occasion, Simon gave an immensely entertaining illustrated talk on the history of ‘Policing the Peninsula’, with many humorous stories from the past, also showing us some interesting artefacts. This created a fascinating journey from the 13th century through to the present time. For our December meeting, the group had a social evening, where we were joined by the Highampton Community Group, and enjoyed a buffet generously provided by the landlord Tony Knight. The evening was well attended by friends, neighbours, and children alike. Our guest speaker in November was Mr Paul Rendall who gave a very interesting illustrated talk about the “Military on the Moor” from pre-history to the present day. Paul related many fascinating facts and figures supporting the importance of Dartmoor in training both British and foreign troops.